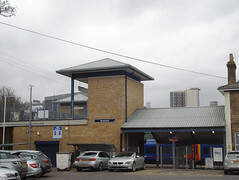 Zone 4 rail station on the Hounslow Loop Line. Trains to Waterloo via Clapham Junction. Note that as this is on a loop line, Waterloo trains go either clockwise around the loop (the quick way) or anticlockwise via Hounslow and Richmond (the very slow way). The two routes join up on leaving the loop at Barnes, and then continue to Waterloo via Putney and Clapham Junction. Last edited 2015-02-21 15:27:37 (version 5; diff). List all versions. Page last edited 2015-02-21 15:27:37 (version 5).